In many of my recent workshops with dance teachers all over the world I have raised the potential issues related to a lack of crawling in toddlers and its effect on a dancer's training later down the track. Exploring different peoples stability on all fours, and how this relates to functional stability of the core was enlightening for many! Crawling is a very important developmental milestone to not only go through, but also to revisit frequently to develop and maintain optimal functioning of the human body. Many teachers understand the relevance of this themselves, and have reported dramatic changes in their students progress after incorporating some of the exercises that we encourage, however the common question is "How do I explain it to the parents?!" Teachers are worried that the parents of dancers will be upset if their child is crawling in dance class rather than standing in first position, so I wanted to write up a post that explains why it's so important! The following article aims to outline why it is important to include work on hands and knees in dance class, and the many benefits to doing so, as well as a few words of caution. Dance class is often the first, formal physical training that an individual gets. Please Note! - If any individual happened to miss out crawling - all is not lost! It also does not mean that they are not living your full potential! The benefits of crawling may have been developed through various other forms of physical exercise such as rock climbing, climbing trees swimming or gymnastics. However, even for students who did spend a lot of time crawling I definitely suggest exploring some of the ideas outlined here, as well as the training exercises in our program A New Approach to Core Stability program. There is an entire section devoted to work on hands and knees, which is hugely beneficial for human beings of all walks of life, not just dancers. Please also note that if a student experiences knee pain, it is wise to deal with this first. Adolescents that have acute knee pain should not be made to crawl if this is painful, however, often knee pain can be linked to a weakness in the very slings that crawling develops. 1. Dance class is often the first, formal physical training that an individual gets. When students are enrolled in dance class at 2, 3 or 4 years of age, the dance teacher is often the child's primary physical educator, and this often continues to be the case for many years. Children are (hopefully) running and jumping and playing outside of class, however for many young individuals dance class is the only time that they are actually moving in an orchestrated way. This places huge responsibility on the dance teacher, as they become responsible for the general physical development of the child in their care. This means teaching them how to be a functional human being, not just a dancer. In any field, our primary duty of care is to first do no harm. One of the biggest flaws I see against this is seeing very young children in baby ballet classes being trained in a turned out position. 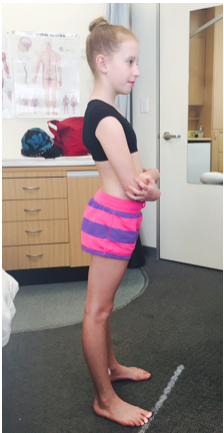 When a toddler cannot balance on one leg (completely normal) it is impossible to expect them to be able to stabilise the pelvis enough to effectively turn out the legs. Introducing games that utilise crawling in baby ballet classes is a great way to make sure that all children develop the strength and coordination needed to move on with their more formal training in the older levels. Premature babies who have less time in the womb to fully develop also often spend time in an incubator in the first few weeks of life with their movement limited by wires and tubes. This may have an effect on the development of the young babies natural movement patterns. Thomas Myers, a leading researcher in the development of the fascial system, wrote a very interesting article about the development of fascial lines in utero, and how swaddling a new baby may shut down some of the already developing pathways in the body. Crawling is considered an essential developmental stage and if it is missed out, or limited, this may have an effect on the stability of the child. This may happen for any number of reasons, from the season that the baby is born in, the weight of the child (Bigger babies sometimes find it harder to sit up and to move) and even cultural differences may play a part. I have discovered that some nationalities discourage crawling in young babies, preferring to carry the child or have it in a pram. Some babies discover alternative ways of moving themselves around, including an asymmetrical "bum shuffle". If this is effective for them they may avoid crawling and scoot around on their bottom until they have the strength to stand up. The following video is a great visual record of one babies exploration of movement and development of crawling. Personality may also have an influence on the development of our physical body: From the “Me too!” attitude that brings a child into standing early (thus limiting the amount of time spent crawling), through to the postural habits of introverted adolescents and their extroverted, confident peers, how we feel about ourselves truly shapes us. 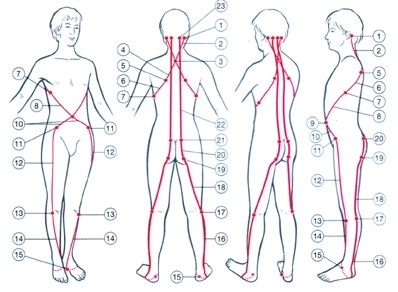 While many people are now aware of the deepest core stabilisers, many are unaware of the essential muscular slings and fascial lines that actually provide stability with movement.Many people have a model of the body that includes each of the separate muscles. In reality, muscles work together in slings and coupled movements to create optimal and effective movement. There are 3 main muscular slings that help us move around efficiently. The Anterior Oblique Sling includes the inner thigh muscles (adductors) and the External Oblique on the opposite side. This is one of the main connections that is developed when a baby/adult/ animal moves around on all fours, and is extremely important in normal walking as well as for dancers in supporting the leg when lifted in a developpé or an attitude devant. 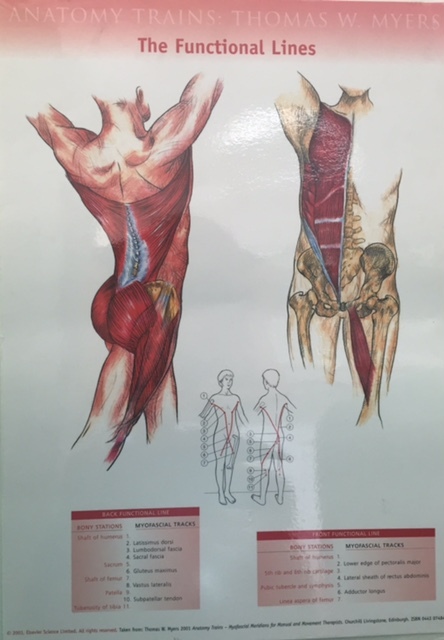 The Posterior Oblique Sling includes the Latissimus Dorsi and the Gluteals and is very important in normal walking, as well as any work in derrière. The Fascial Lines are very important in both developing optimal mobility, and strength without bulk, essential elements for any dancer. Some young people lack the varied physical exercise needed to develop these patterns naturally or only perform certain movement patterns in their structured dance classes. However, there are lots of ways to bring fun and engaging exercises into the studio, that will have many benefits on both cognitive and physical development. Introducing crawling in any movement class different depending on the age level. In very young students, simply introducing games that require the student to move around on hands and knees will help them find their own stability. While playing with my three year old nephew, who is obsessed with animals, I started exploring different ways of moving on all fours. Exploring the difference between the quality of a cat, a rhino and a gazelle brings forward all kinds of movement patterns! However, I am certainly not the only one to play with this, and there is a nice series of exercises which can be found online in the “Animal Flow” series by Mike Fitch. Animals to try include: Frog, Ape, Breast, Crab, Crocodile and Scorpion. When working with older students or adults who are further away from the natural pattern of crawling, and may have developed some adverse movement patterns, it may need to be done much more carefully. Our New Approach to Core Stability program explores many safe and progressive ways to bring work on hands and knees into your current conditioning program. Crawling should be one of the most natural movements, but for many people it is surprisingly difficult. However, with a little focused practice, restoring the natural crawling motion can have a huge influence on your overall stability, especially on the Anterior Oblique Sling. Start on all fours, then lift the right hand and the left knee off the floor. Place hand and knee forward slightly and accept weight onto them before lifting and replacing in the starting position. Repeat on the other side. Do this several times, using the opposite arm and leg each time, with a small stability ball paced at the top of the Sacrum to check for stability, before starting to do the second crawling exercise. Once you can perform the transfer of weight while keeping the ball stable, try sequencing it together to perform normal crawling. Keep it slow and deliberate initially, making sure not to sink into the supporting shoulder or drop the pelvis over the supporting leg too much. If you have any issues with your knees it may be wise to wear some knee pads when doing these exercises. Perform ten crawls forward, and then reverse back to your starting point. You might like to try balancing a yoga block or small stability ball on your pelvis to maintain stability. Once you can crawl easily on your hands and knees, try increasing the load by starting in a 4 point hover position. Crawl forward with opposite arm and leg as for the first variation.